Mergers and acquisitions are approached carefully and reviewed in depth. While they can help make the company an industry leader, they can also destroy in the company by overloading it in debt. Volvo Construction Equipment Korea, which was created when the Swedish company purchased the construction equipment business from Samsung Heavy Industries in 1998, celebrated its 20th anniversary last week in a festive mood, looking back on the growth achieved. Volvo CE President Melker Jernberg who visited Korea for the anniversary event, called the company’s Changwon plant in South Gyeongsang Province a global hub for excavator production and R&D, as it seeks to become a top industry player here with a market share of over 25 percent market in the future. Since purchasing Samsung Heavy Industries’ construction equipment business, Volvo CE Korea has reaped notable growth in excavator sales and grown in importance within the corporation. Alongside Doosan Infracore and Hyundai Construction Equipment, Volvo CE Korea is one of the top three construction equipment companies here, accounting for about 20 percent of the local heavy equipment market. “Changwon is a global hub for excavator production and technology, helping other sites when it comes to engineering and how to build excavators etc. 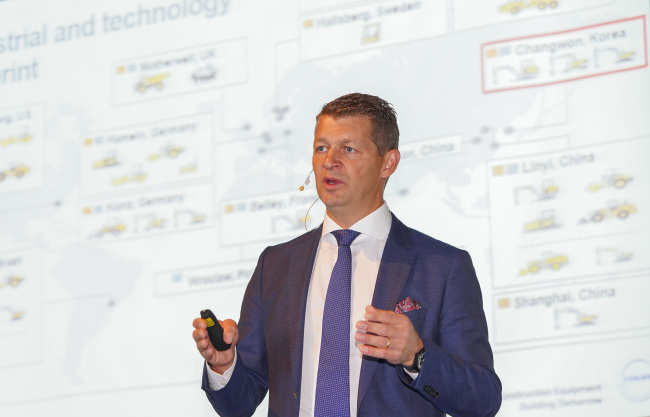 (It is) also a competence center when it comes to technology in excavators,” Jernberg said in an interview on the sidelines of its 20th anniversary media event last week in Seoul. Korean engineers are relocated to around the world to spread the latest practices to other Volvo CE’s global industrial network. Changwon factory, which makes up to some 55 percent of excavators the company produces globally, looks set to rise in value as it excavator business continues to expand, Jernberg said. To bolster R&D, 15 billion won ($13.2 million) was invested to make the industry’s first-ever Virtual Product Development Center for excavators located within the Changwon complex. The facility opened in 2006 and is equipped with a real time virtual machine simulator for better production efficiency and product quality. In terms of production size, Changwon stands as the company’s second-biggest plant worldwide after a plant in Sweden that mostly produces components. According to Jernberg, the striking performance at the local unit stems back to the purchase of Samsung Heavy Industries’ construction equipment business, which he described as a great success the company is extremely proud of. Standing as one of Volvo Group’s most profitable acquisitions, earnings at Volvo CE Korea have increased about fivefold since the purchase due to its export-centered business strategy, investment in R&D, and meticulous sales and marketing. The local unit posted 1.9 trillion won in earnings and 160.5 billion won in operating profit last year compared to 367.8 billion won in earnings and an 18.2 billion won operating loss in 1999, figures from the company showed. By transforming the money-losing company to one that exports 80 percent of its products across some 120 countries, the government acknowledged Volvo CE as a leading exporter and first heavy equipment company to post $200 million in single heavy equipment sales in 2000. Prior to joining Volvo CE as president last year, Jernberg was the CEO of Swedish powdered metal producer Hoganas AB between 2014 and 2017. He has also experienced working at Swedish aerospace and defense company Saab, and built most of his career at Swedish commercial vehicle manufacturer Scania AB.